Recent research into reverse mortgages to fund retirement suggests that the conventional wisdom of spending home equity as a “last resort” after other savings are depleted should be rethought. On the contrary, I believe there are many retirement scenarios in which spending home equity as the last resort is the best resort. 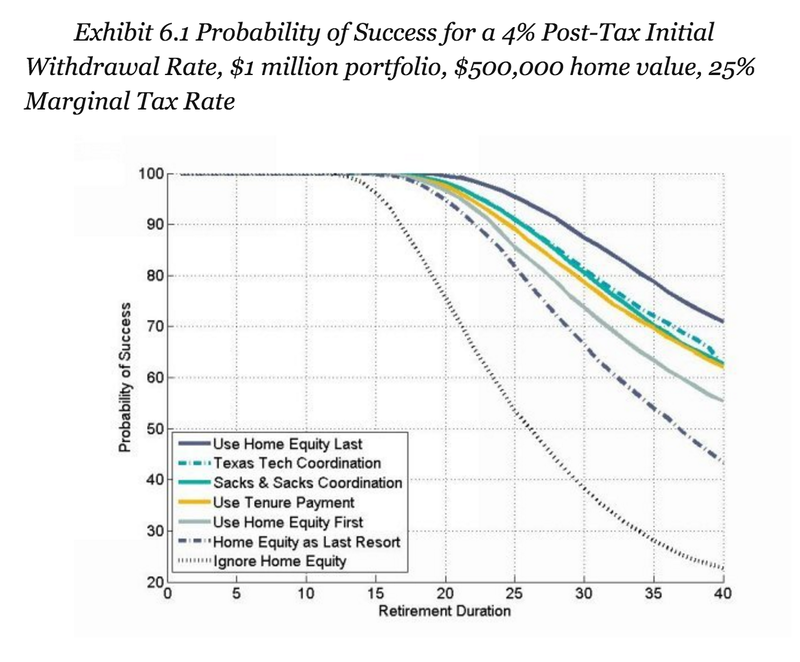 The “don't wait” philosophy stems primarily from a paper written by Barry Sacks and Stephen Sacks in 2012 and the current unique circumstances for HECM reverse mortgages. “A retiree whose primary source of retirement income is a securities portfolio and who also has substantial home equity must decide early in retirement whether to live within the safemax limit set by his or her portfolio . . . This decision is a fundamental component of overall retirement planning . . . The decision process also must take into account the degree of economic discipline required to live within the safemax limit. The term “SAFEMAX” derives from the work of William Bengen and typically refers to a “safe withdrawal rate.” Historically argued to be around 4% to 4.5%, more recent work by Wade Pfau suggests that in the current low-interest rate environment the “safe” rate may be closer to 3%. In other words, for retirees willing to risk spending more (about 5% to 6.5% instead of 3% to 4%) from a volatile portfolio than planners have conventionally considered safe, using home equity to leverage an investment portfolio might provide better outcomes. That's a far cry from claiming that the conventional wisdom of spending home equity as a last resort is wrong, as subsequent reviews of the paper may have suggested. 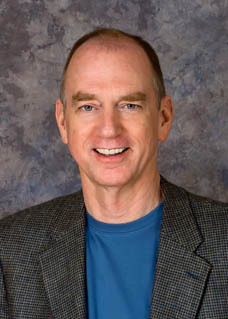 Wade Pfau concluded in his 2016 book, Reverse Mortgages, that a simple strategy of opening a HECM reverse mortgage early in retirement and not using the line of credit until late in retirement outperformed both of the currently-proposed “coordinated strategies” and the use of tenure payments. "Of the six strategies that use home equity," Pfau reports, "the strategy supporting the smallest increase in success is the conventional wisdom of using home equity as a last resort and only initiating the reverse mortgage when it is first needed . . . Meanwhile, the "use home equity last" strategy provides the highest increase in success rates." The current unique circumstances for the HECM are the increased loan limit of $625,500 and present historically-low interest rates. When combined, these two factors could allow a borrower to create a very large line of credit, perhaps greater than the home's fair market value over a long retirement. As Jim Veale recently explained in a comment, the maximum HECM loan amount was increased from $417,000 to $625,500 as part of the American Recovery and Reinvestment Act of 2009. Many believed the increase would be temporary but it has thus far survived. Regardless, there are many conceivable retirement scenarios in which spending home equity as a last resort, as the conventional wisdom holds, would be advantageous, given that opening the line of credit early is a clear benefit with any strategy. Some retirees want to pass their home debt-free to heirs. They probably should not borrow a reverse mortgage. Some don't plan to keep the home in their estate and won't mind risking ownership. Still others would like to leave their homes to heirs but realize they might not be able to pay for retirement without using home equity. By spending home equity as a last resort instead of committing it early in retirement, the latter group might find that they never need to risk their home or that they can at least minimize the amount of equity they do need to spend. Think of it as matching home equity to contingent late-retirement liabilities. Imagine a couple that divorces late in life after spending a lot of their home equity. Neither wants to continue living in the home. Perhaps neither can afford to continue living in the home, given their new financial situations. Their best financial alternative may be to sell the home, in which case their HECM will have to be repaid. Although they had planned to age in the home, they find themselves leaving the home and without much remaining home equity to pay for new housing. I was recently asked to explain how this couple would have been better off by not borrowing the HECM. The answer is that the HECM may have encouraged them to spend more than was safe early in retirement, leaving them with little financial reserve in a crisis. Committing to an early-spending reverse mortgage strategy (matching home equity to early-retirement liabilities) involves betting that the household will remain in the home and age in place. It is a bet against divorce and the early death of a spouse. It is a bet that you will feel the same about your home in 10 to 15 years that you do at the beginning of retirement. It is a bet that your home will accommodate future infirmities. As Shelly Giordano's book on reverse mortgage suggests, waiting a decade or so before committing to spending your home equity provides more time to see how your retirement will unfold. As I explained in Why Retirees Go Broke, the reason is usually a positive feedback loop of financial setbacks stemming from spending shocks, not from sequence of returns risk or poor investment results. Health care costs are an obvious risk, but there are many potential spending shocks that could leave a HECM borrower unable to afford their home going forward. In those instances, the HECM will need to be repaid leaving the borrower with little equity to help with housing costs. A wealthy corporate executive was driven into bankruptcy by his wife's Alzheimer's disease. A woman's home is being taken by the state using eminent domain to build a highway through the property. A couple needed to move his father into their home as his dementia progressed. These crises might also occur after you spend your savings and begin spending home equity as a last resort, of course. In that event, you simply ran out of money and neither spending strategy was likely to save you. The danger is in finding the opportunity for additional consumption early in retirement too attractive and experiencing a more critical need for the reserves later in retirement. Retirees who spend home equity as a last resort after depleting their portfolio will not simultaneously hold reverse mortgage debt and an investment portfolio – they will hold them sequentially. That doesn't mean they won't have leverage from other debts, or that the amount of leverage created by the reverse mortgage will be imprudent. That depends on the rest of the balance sheet. But, it does provide an opportunity to manage that leverage.